Step 1: Find out what you are passionate about. Photo Credit: Madison Harrison at 8 years old. I remember when my mom started her business it made me want to start a business too. I wasn’t sure what I wanted to do but after watching my mom’s friend, Mrs. Wendy, take photos of my grandmother in her photography studio, I thought, that’s it! I’ll start a photography business. Seeing the reaction on my grandmother’s face when she saw the photos that Mrs. Wendy took, it inspired me to pursue photography as a business. I wanted to photograph little girls and their dolls. I wanted them to look at their pictures the same way my grandmother looked at hers. I wanted them to have photos with their dolls to cherish forever. I want to share with you ten helpful tips to becoming an kidpreneur, a kid that’s an entrepreneur, based on my experience. One: Find what you are passionate about or find something that you like to do and do it. I found out that I liked photography and that’s what I pursued and I am happy that I did! Two: Turn your passion into a business so you can serve people and make money doing what you love. 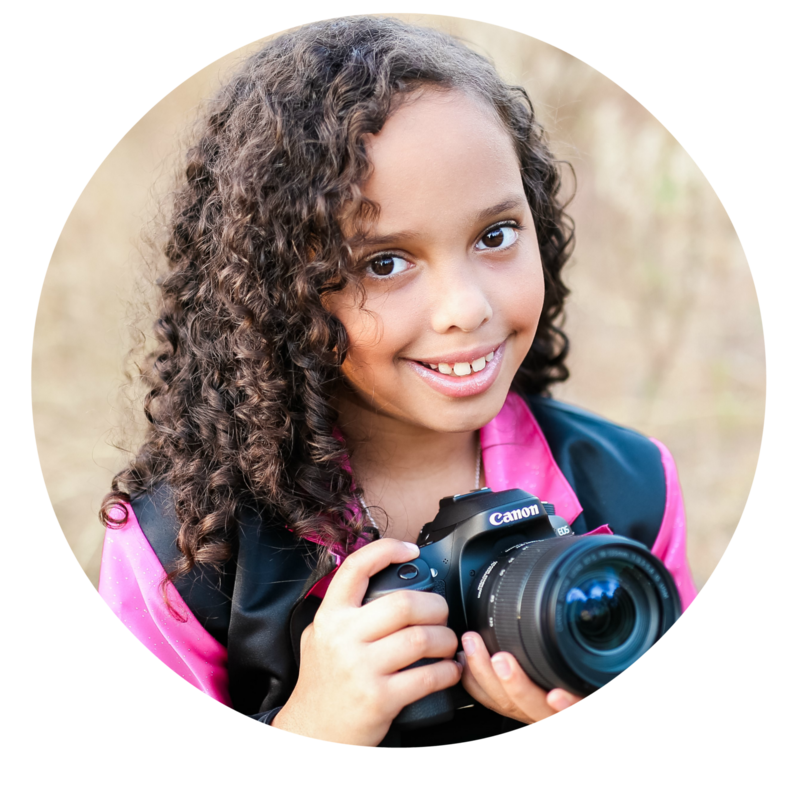 When I realized at seven years old that I really loved photography and I loved how people reacted to seeing themselves in the photos I took, I realized that it was the right time to start my business. Three: Start a social media account and make it look professional. As a photographer, it was important for me to showcase my photos so that anyone who was thinking about hiring me could see my work. Four: Find partners to help and support you and your business. For example, my mom and my dad are my biggest supporters and encouragers. Whenever I come up with ideas for photoshoots, or my next big dream, my parents always help me to make it happen. I found out that you can’t do everything by yourself, especially when you are ten. Five: Do your first event but don’t charge money yet. Since people don’t know you or what your product or service is yet, you may not have a big turnout. When I was first starting out, my mother said not to charge for my first photoshoot; so, I asked Mrs. Wendy if I could rent her studio for $2 an hour for 3 hours. I was so happy when she said yes. I made a flyer and we advertised on Facebook. About 12 little girls came to my first photo shoot with their dolls. That was the exposure I needed to get my business going. Six: Try to book yourself on local TV. My media coach, TeeJ Mercer teaches you how book yourself on TV without a publicist (someone who is responsible for publicizing a product, person or company). Even though I didn’t have to do that, she did prepare me to speak in sound bites (short catchy phrases) and not be nervous when I went on the Steve Harvey Show. Seven: Keep doing events to get yourself out there. Just like when I kept doing event photography, photo shoots and private shoots. I also started to speak at different events. It helped me to get exposure and experience. Choosing a charity to work with helps too. Not only are you helping to raise money and awareness for the organization, but it allows all their supporters to learn about you as well. Joining a networking group helps you to meet people and to meet future clients. I love going to networking events with my mom. I met some incredible people who have been very supportive of me and my business. Eight: Don’t EVER give up! Sometimes it seems like what you want to accomplish will never ever happen. It took almost two years before my dream to photograph the President of the United States came true. For almost two years I continued to share my dream on social media using the hashtag, #HelpMadisonMeetPOTUS. Last June I was invited to photograph former President Barack Obama at the United State of Women summit, a conference attended by 5000 women and hosted by Michelle Obama and Oprah Winfrey. You must believe in yourself and your business and you cannot give up when it seems like things are taking forever. It was because of photographing the President that Steve Harvey had me on his show. If I would have given up, my dream would not have come true and I probably wouldn’t have been on a national talk show. Don’t forget to start a business account with a bank or a credit union so you don’t start spending all your money on stupid stuff like candy and dolls. Nine: Don’t forget to start a business account with a bank or a credit union so you don’t start spending all your money on stupid stuff like candy and dolls. Make sure to save money and you will have to use some money for business supplies. I chose Grow Financial because when I went there I liked how they treated me as a real business customer even though I’m a kidpreneur. Ten: Be a Mentor! When I first started, someone helped me get to where I am and you should be that someone to help another kid to follow their dreams or to just introduce them to what you do. My mom always says that “children need exposure”. If we expose children to our different talents, it lets them know that they have options. I did this very thing with my friend, Ava. Ava is 5 years old. She was my second shooter for a recent event where I hosted a “Princess Party” for foster children instead of celebrating my 10th birthday with a party. (A second shooter is a photographer that is asked to work alongside the main photographer). Becoming a kidpreneur may seem intimidating at first, so breaking it down into smaller manageable steps makes it easier. I know I am just a kid and I don’t have all the answers. I can only share with you what I’ve learned over the past almost three years. I hope I have inspired you to follow your dreams. Always remember to have fun with your business and don’t forget the most important thing, help others and stay humble. Follow @photoswithmadison on Facebook and Instagram. Please also visit my website and check out my blog, “CLICK” at photoswithmadison.com.